He was born in pasto - Colombia in 1993. 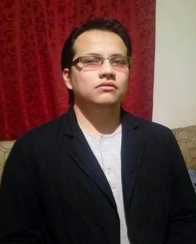 Currently, he is developing his degree work to opt for the degree of Electronic Engineer at Universidad de Nariño. Applied maths,Artificial intelligence, Machine Learning, Autonomous robots, Data clustering, Dimensionality reduction, Image processing, Data visualization, Unsupervised analysis, Artificial vision, Time-varying data analysis.